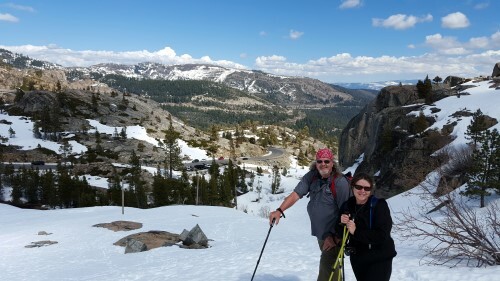 The Donner Pass Summit Tunnel Hike was a fantastic hike, filled with spectacular views, American history and snow…lots and lots of snow! Coming from Florida I have seen plenty of snow on TV, and was fully prepared with a jacket, hiking shoes and thick socks, to take this hike on. We parked alongside of Old Hwy 49, I opened the passenger door took one step out into the snow and sunk to my knees. So, maybe this will require a little more thought. Aha! I got it! I’ll bring my hiking sticks! I ran around to the trunk of the car grabbed my hiking sticks and proceeded with my husband to get a glimpse of the infamous Tunnel #6. The first Transcontinental Railroad to traverse the Sierra Nevada Mountain Range, did so through Tunnel #6. Completed in 1867, this 1,659 foot tunnel was constructed mainly by Chinese Immigrants. It was the most difficult obstacle that faced the Central Pacific Railroad. 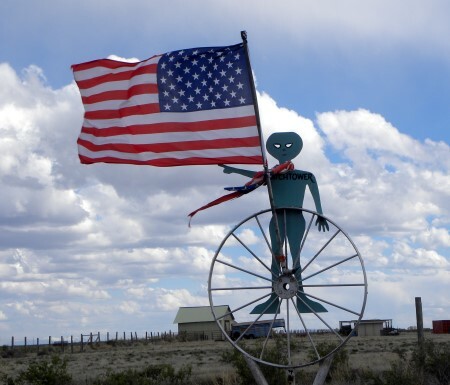 At 19 feet high, 16 feet wide with a half circle of an 8′ radius at the top, it was larger than anything that had been attempted of its kind in the United States! You would think it’s just a bunch a digging, how hard can it be? Well, actually pretty tough, as the Sierra Nevadas are all granite. 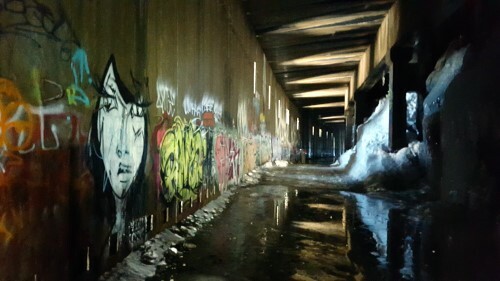 It took a group of 30-40 Chinese workers for each tunnel. 12-15 of the workers would drill while the others would remove the debris. In order to drill a 2 foot deep hole, one man would hold the drill bit and two others would hit it with sledge hammers. After each hit, the man holding the bit would rotate it a quarter turn and they would hit it again. They would then fill the holes with black powder or nitroglycerine, light a fuse and run! Then all the material that was blasted away would be hauled off by the remaining workers. This continued 24 hours a day, 6 days a week for two years. The first passenger train passed through the tunnels in 1868 and the last in 1993. Back to the hike…after I got my hiking sticks out of the car, Chris and I attempted our hike up the mountain side to Tunnel #6. Every other one of our steps ended up with us up to our nether-regions in snow! We decided that there had to be a better way and headed back to the parking lot to re-convene and consider different options. It was there that we ran into a couple of good ol’ boys that looked as if they had done this once or twice before and asked them what it was that they thought we were doing wrong. They looked us up and down and said “You guys need snow shoes, if you want to get up that mountain”. 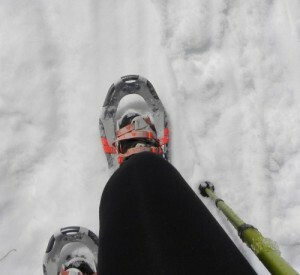 Snow Shoes! That sounded so exciting to us Floridians, we couldn’t get in the car fast enough! So off we went to Granite Chief Lake Tahoe Ski Shop in Truckee, California, grabbed our new snow shoes and hustled back to the trail for attempt number 2. We got back to the trail, slapped on our snow shoes like pros, and began our hike. WOW! What a difference! We had only hiked a short distance when Chris looked back at me and said “They’re like big flip flops! I’ve been training for this my whole life!” and he has too. Once we had our new shoes we were able to hike where ever we wanted to go…and we did. Most importantly we had a blast. 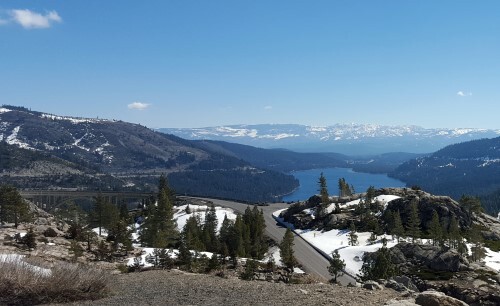 I have no idea what Donner Summit looks like when all the snow is gone and spring has touched this place, but if you have a chance to go towards the end of winter when the snow is still on the ground, I highly recommend it. I suggest taking I-80 until you get to Historic SR 49 then take SR 49 over the infamous Donner Summit Bridge. 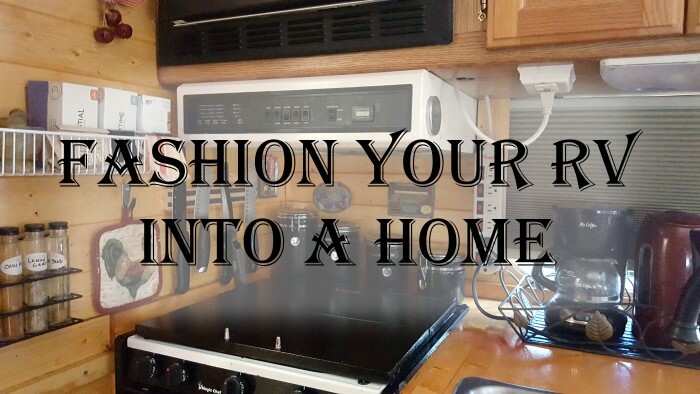 I also recommend bringing snow shoes! 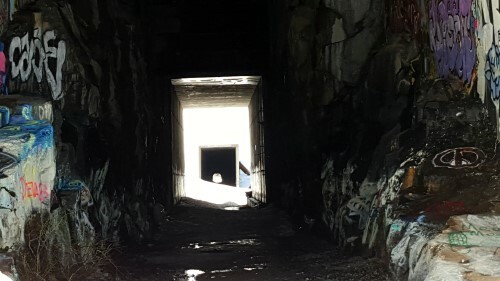 This entry was posted in California, Destinations, General, Hikes and tagged California, donner summit tunnel hike, hiking. Bookmark the permalink.